Rwanda is sometimes referred to as the land of one thousand hills(“Pays des Mille Collines” in french), and after pulling into Kigali I could see why. I had been itching for a run for a while on our safari – for some reason our guide wasn’t keen on me running with the lions in the Serengeti, so I jumped at the chance when we arrived in Kigali. 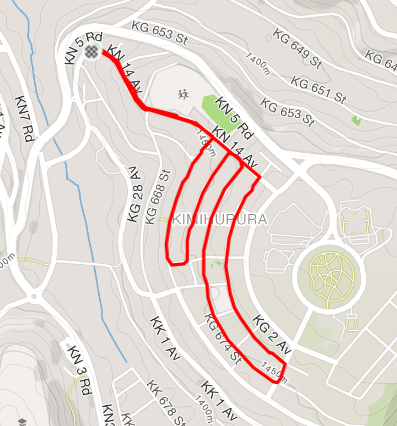 Finding a path that wasn’t entirely up and down was a challenge, but I managed to scout a few parallel roads wrapping a hill which were perfect. As a tall lanky white dude, I’ve gotten used to sticking out like a sore thumb in many of the places I run, and Kigali was the same. The people though were very friendly, and I got several hellos along with a few odd looks while out in the morning sun.